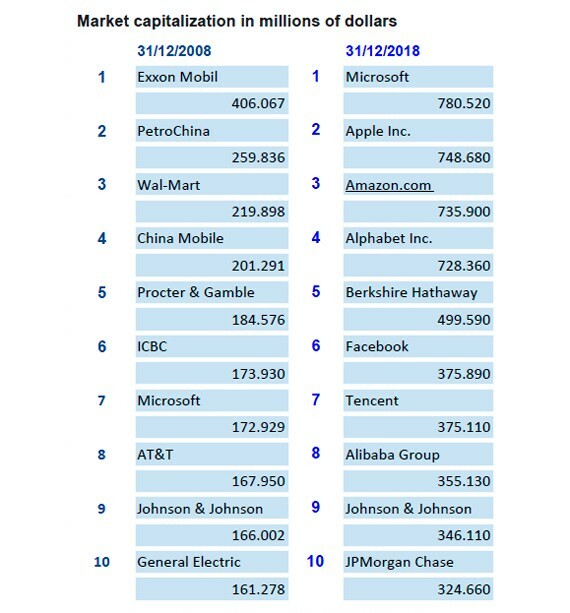 If we do a #10yearchallenge on how stock markets have evolved from 2008 to 2018 it is apparent that in the global ranking of corporations based on market capitalization, oil companies — which led the trading floor rankings for decades — have been replaced by so-called digital natives. Yet another symptom of the wager the new economy is making on companies with the best capabilities to process data as raw materials and transform them into useful and actionable information. Fuente: Financial Times Global 500, Wikipedia. We are in a race to materialize the competitive advantage that comes from having the attention of millions of customers and learning from how they use all kinds of services. This makes it possible to respond to demand quickly and provide digital service users useful, customized and distinctive assistance. Income can continue to come from a subscription model, or it could be based on marketing, but one way or another, service development is based on data. In this race, corporations have started by working on the sources of information that were most accessible to them: interactions with their own customers. However, the vision obtained from this analysis is partial and opportunities exist for society as a whole when the barriers separating institutions and the government are broken down. Of course knowledge and consent is needed from those individuals who generate that digital footprint with their everyday activity if the model is based on personal data. The European Union has been legislating and reflecting on this for some time now. The initiative Building a European Data Economy, together with the regulation on a framework for the free flow of non-personal data in the European Union, and the legislative changes in terms of privacy (GDPR), are a reflection of this concern for fomenting innovation and a free flow of data on the one hand, while also giving citizens the utmost guarantees over their personal information, which must remain under their control. 1. Disconnected, disperse sources. As users of digital services (transportation, finance, telecommunications, news or entertainment) we leave a different digital footprint for each service that we use. These footprints, which are different facets of the same polyhedron, can even be contradictory on occasion. For this reason, they must be seen as complementary. Analysts should be aware that they must cross data sources from different origins in order to create a reliable picture of our preferences, otherwise we will be basing decisions on partial or biased information. How many times do we receive advertising for items we have already purchased, or tourist destinations where we have already been? And this is just one example of digital marketing. When scoring financial solvency, or monitoring health, the more complete the digital picture is of the person, the more accurate the diagnosis will be. Furthermore, from the user’s standpoint, proper management of their entire, disperse digital footprint is a challenge. Perhaps centralized consent would be very beneficial. In the financial world, the PSD2 regulations have already forced banks to open this information to other banks if customers so desire. 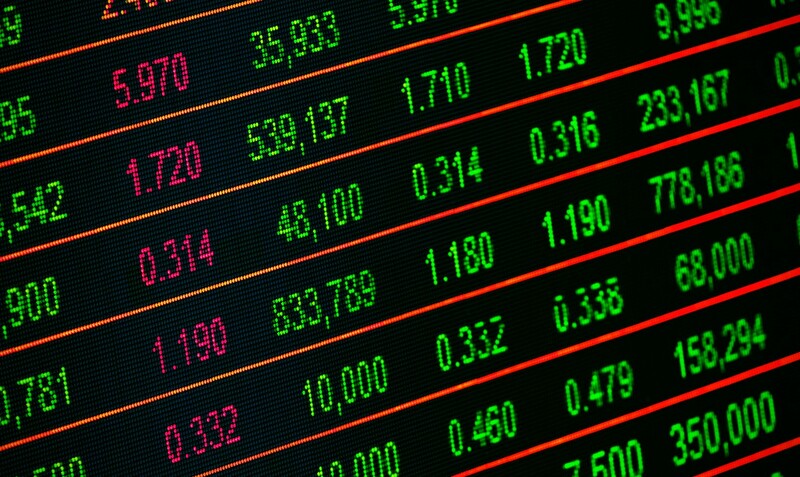 Fostering competition and facilitating portability is the purpose, but this opening up has also enabled the development of new services of information aggregation that are very useful to financial services users. It would be ideal if this step of breaking down barriers and moving toward a more transparent market took place simultaneously in all sectors in order to avoid possible distortions to competition and by extension, consumer harm. Therefore, customer consent would open the door to building a more accurate picture of our preferences. 2. The public and private sectors’ asymmetric capacity to gather data. This is related to citizens using public services less frequently than private services in the new digital channels. However, governments could benefit from the information possessed by private companies. These anonymous, aggregated data can help to ensure a more dynamic public management. Even personal data could open the door to customized education or healthcare on an individual level. In order to analyze all of this, the European Commissionhas created a working group including 23 experts. The purpose is to come up with a series of recommendations regarding the best legal, technical and economic framework to encourage this information transfer across sectors. 3. The lack of incentives for companies and citizens to encourage the reuse of their data.The reality today is that most companies solely use the sources internally. Only a few have decided to explore data sharing through different models(for academic research or for the development of commercial services). As a result of this and other factors, the public sector largely continues using the survey method to gather information instead of reading the digital footprint citizens produce. Multiple studies have demonstrated that this digital footprint would be useful to describe socioeconomic dynamics and monitor the evolution of official statistical indicators. However, these studies have rarely gone on to become pilot projects due to the lack of incentives for a private company to open up to the public sector, or to society in general, making this new activity sustainable. Digital footprints have real potential to describe socioeconomic dynamics and monitor the evolution of official statistical indicators. / Image: creative commons. 4. Limited commitment to the diversification of services.Another barrier is the fact that information based product development is somewhat removed from the type of services that the main data generators (telecommunications, banks, commerce, electricity, transportation, etc.) traditionally provide. Therefore, these data based initiatives are not part of their main business and are more closely tied to companies’ innovation areas where exploratory proofs of concept are often not consolidated as a new line of business. 5. Bidirectionality. Data should also flow from the public sector to the rest of society. The first regulatory framework was created for this purpose. Although it is still very recent (the PSI Directive on the re-use of public sector data was passed in 2013), it is currently being revised, in attempt to foster the consolidation of an open data ecosystem that emanates from the public sector as well. On the one hand it would enable greater transparency, and on the other, the development of solutions to improve multiple fields in which public actors are key, such as the environment, transportation and mobility, health, education, justice and the planning and execution of public works. 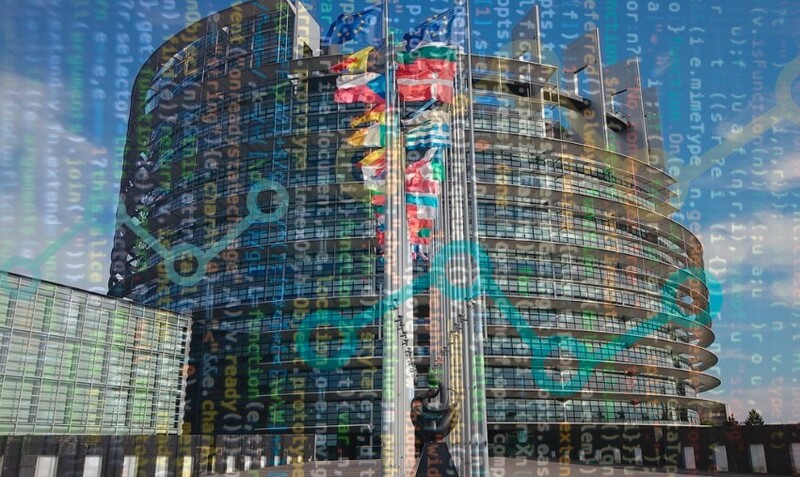 Special emphasis will be placed on high value data sets, such as statistical or geospatial data — data with tremendous potential to accelerate the emergence of a wide variety of information based data products and services that add value.The Commission will begin working with the Member States to identify these data sets. In its report, Creating Data through Open Data, the European open data portal estimates that government agencies making their data accessible will inject an extra €65 billion in the EU economy this year. 6. The commitment to analytical training and financial incentives for innovation.They are the key factors that have given rise to the digital unicorns that have emerged, more so in the U.S. and China than in Europe. These are six issues to reflect on as our society heads toward a new context in which elements like the IoT and 5G technology will considerably increase the generation of all kinds of data. A foundation brimming with potential to foster innovative ideas that benefit everyone. *Note: in addition to the author, Álvaro Martín Enríquez, Ana Isabel Segovia Domingo, Elena Alfaro and Tomasa Rodrigo López contributed to the writing of this article with their ideas and comments.